Upgrades can be purchased at any time after general admission ticket is purchased. *A small gathering with Sri Master Gano Grills on the evening of Saturday April 13th 2019 @ 8p.m. 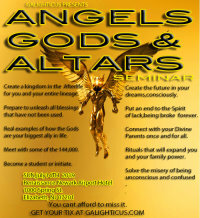 You do not have to attend any prior event to participate in this seminar. We welcome all levels of spiritual education. The only thing we require is that you come with an open mind and a peaceful heart. We look forward to meeting you all! Did you know that the Altar is one of the most important things in your life? People have bank accounts, investment portfolios, assets, properties and real estate but no altar, then they wonder why something feels like it is missing from their lives. The altar is your own personal connection to the spiritual world. The spiritual world is hidden from view for one reason; It is too high of a vibration for the human eye to see. Yet and still, the forces of that world rule everything that is seen in this world. How can that be? Why is that? It is simply because our world is an offshoot of the spiritual world with much less power. Why not has a conscious relationship been built with that world? Much of what I have personally seen on YouTube and Wikipedia about the altar is flawed or incorrect. Therefore, many people have a non-working shrine in their home that has no power from the spiritual worlds. They think it is a working altar, however, this is not the case. 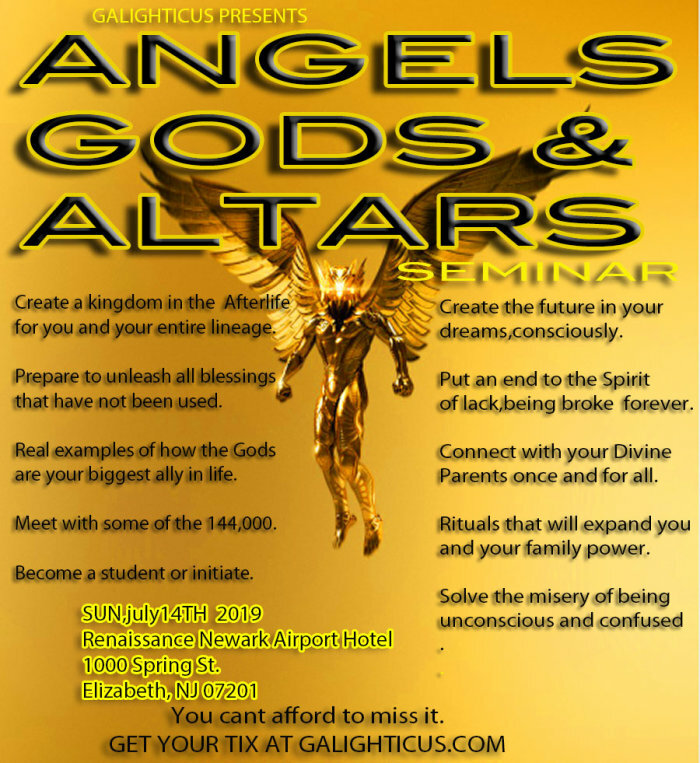 This is the reason why on January 9th 2016, Galighticus hosted the very 1st Angels Gods and altars seminar in New York. It coincided with the birthday of the Jade Emperor, known in the spiritual worlds as the banker of heaven. According to his mythology, he is the one that controls the currency of money that funnels to our world and other worlds through his own divine account and treasury system. He has acquired this power by completing 1 billion lifetimes. The other Gods of wealth interact with his vast knowledge and power. We will teach you about those Gods. We have given the most data and ritual that has helped thousands of people become free of their financial burdens, as well as spirit of lack. This will be the 6th time that we present this powerful seminar, to assist humanity in the struggle to end their financial woes and actively connect with their own root system that comes from their own ancestors. Did you know that when the gods see that you ignore your ancestors, they will not be inclined to give you their power. They know that the natural order of things is for humans to connect with their own power source first, which happens to be the ancestral system. In the underworld there are many blessings and treasures that are bypassed by the willful conscious ignorance of the ancestors. This is ancient knowledge that has been forgotten by humanity, which actually leads to suffering on many level. This seminar will give a superior education to the attendee so that financial struggle, spiritual ignorance, and divine estrangement are all things of the past. The Divine Inscription Is a rite that only an Exalted Being can perform. During the days of the last Golden Age that Earth was privileged to see, Lord Thoth/Tehuti gave divine inscriptions to the souls of his students, adepts, devotees, and high priests. On certain occasions, he would even give them to the gods that he had a close relationship with, of which there were many. This sometimes takes place in the spiritual realm zone of which there are many. One has to achieve a great karmic credit in order to receive the divine inscription. The divine inscription is a celestial energetic signature that is dawned upon the soul and recognized on every dimension, world, or heaven. It is somewhat of a Passport that higher beings would recognize and interface with happily because they know that the wearer is an individual that has received ase' [Divine signature] favorably. This rite is included for All Platinum ticket holders. And it is one of the options for VIP ticket holders. It can also be purchased separately for all those with VIP tickets wishing to have this rite in addition to either Khord cutting or Celestial touch. Warning: This rite can cause great emotional travail and release. Celestial touch is a portion of divine energy that is placed in your body by Sri Master Gano Grills. Your soul will take that energy and utilize it to create an arrangement, circumstance or an event in your life when it sees that you deserve it. This will be something that enhances your life in a powerful way. Serves as a way to freedom from old energetic ties that do not serve the divine destiny path of the recipient. You must be 18 & over to attend this event. Breakfast starts at 8am, the seminar will begin at 9am. Lunch is only included with the VIP, Platinum & Diamond packages. Seminar start time is subject to change. We will notify you via email of any changes. Please be advised that the seminar is a divinely orchestrated event, therefore, it is impossible to predict exactly when it will end. We advise those that plan to attend make travel arrangements that will allow them to stay in the venue until at least 10pm if we go over the time listed so you may get all information presented that day. The Galighticus team reserves the right to refuse entry & issue refunds for tickets at our discretion, however, in most cases store credit will be issued for a future event if you are unable to attend the event after purchase of tickets/upgrades. The information and modalities we offer are not a substitute for medical attention as prescribed by a physician in some cases. We are not responsible for any illness that may occur due to medical neglect. The possibilities are endless when you choose to be taken out of the confines of human limitation. You are on the precipice of a life changing experience with this Divine event! Our GALIGHTICUS community has been given many modalities that will assist in the world's ascension as well as enlightenment. We are the only community on the planet who has a covenant with 22 of the universe's most important Divine Beings plus 44 more. SRI Master Gano Grills is a WORLD CLASS Spiritual Advisor and SRI (spiritual PhD - a title only given by the Gods) Master Teacher to many who are seeking enlightenment.